Here’s a question for you: who does breakfast in your house? You? Your partner? Your caregiver? How much variety do your kids have for breakfast, and — with the huge abundance of high sugar / high calorie breakfasts for kids — how strict are you in what they’re allowed to have? 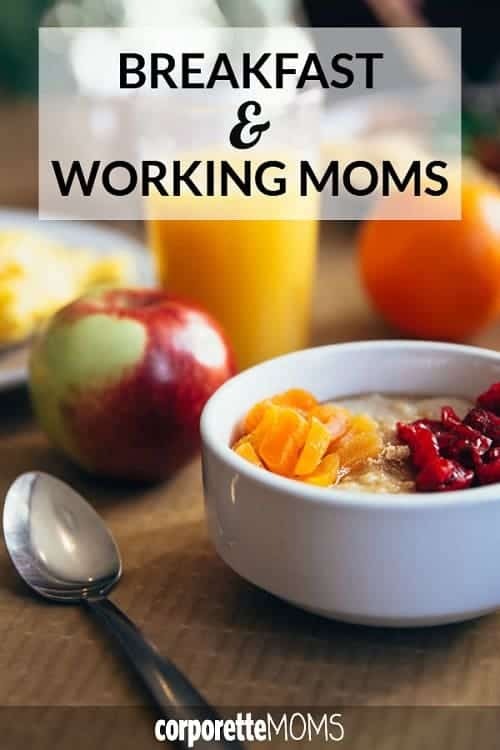 Psst: check out our last discussion on how to make mornings easier as a working mom! My son gets sugary cereal sometimes when my husband does breakfast. He is responsible for getting the kids out of the door every morning (I do pickup), and it’s not what I prefer, but he’s the one doing it so I’m not going to nitpick. Most days my son’s before-school program does breakfast, though, which is much more balanced. It’s also a hot breakfast which is more than we can pull together. Our go-to if we do weekday non-cereal breakfast is microwavable jimmy dean sausage patty (sometimes on a biscuit), fruit, and milk. Breakfast does not happen for me. Either my husband or I feed our 1 year old LO breakfast, usually as I am in the kitchen packing my lunch, unloading the dishwasher or otherwise getting ready to go. If I’m making it for her, it is usually a fruit (half a banana or a pear usually), sometimes with cheese or banana bread (homemade) or a slice of whole wheat bread (homemade) toasted with a smidge of peanut butter on it, depending on if she nursed earlier and how hungry she is (not a big morning eater) and how much weekend baking I did. She also drinks milk with it. Allergic to non-extensively-baked eggs, so that is not an option. If husband feeds her, it is usually the stonyfield baby yogurt in apple or blueberry (the sugar content isn’t awful and we aren’t sugar hawks to begin with), unsweetened apple sauce pouch, yogurt melts or banana bread. 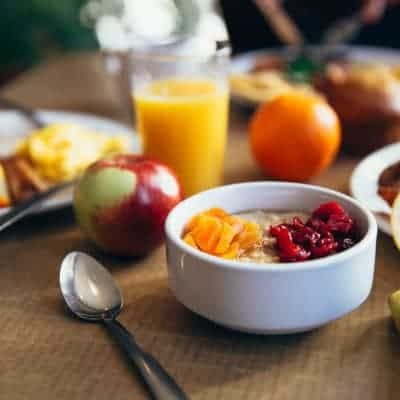 On weekends one morning is usually like a weekday; the other morning is usually more brunch – usually biscuits or waffles (oddly enough, the eggs in waffles don’t bother her), often bacon, frequently cheese, sometimes (adult) oatmeal with some honey drizzled on. I eat cheddar cheese sticks in the car, followed by cereal and milk at my desk later in the morning, or an english muffin with peanut butter on it. When I was pregnant and couldn’t eat bread, it was apple slices with peanut butter and 2 glasses of milk every morning. I make a dozen “healthy” muffins (either spinach/banana or pumpkin oat) every week or so for my toddler. Both my go-to recipes are whole wheat, use less than 1/3 cup added sugar, and have a veggie in them, so I don’t feel like it’s as bad as a lot of high-carb breakfasts. He loves them and it’s a good way to get some veggies in him in the morning. I’m not Knope but highly recommend “superhero muffins” (google it, there is a version on Dinner a Love Story). Made with almond meal, lots of protein. Toddler-friendly. I also sub chopped prunes for raisins. +1. We love the superhero muffins, and if I sub margarine for butter, they are one of the most nutritious and high-energy things I can eat (see yesterday’s MSPI lament). – If you use the zucchini per original recipe, they can sometimes turn out a bit wet, so make sure the zucchini is drained. – Overly ambitious toddlers will sometimes want to help you grate the zucchini and carrots; beware grazed knuckles! I feel like breakfasts are the one meal that gets done right in our house! At least for our kid. First thing she gets is yogurt. There is a low sugar kind she loves that I can just buy, pull out of the fridge half asleep, and plonk in front of her. Literally easier than even pouring my coffee. While she eats that, I usually fry up an egg for each of us. Husband makes and pours coffee, gets the bread from the toaster, sticks a piece in front of each of us. Fruit gets grabbed on the way out the door, so it’s either apple, banana, or nectarine. Done! Frosted Mini-Wheats have been my kid’s weekday breakfast of choice for a while now. Filling and a decent source of fiber. Sometimes we add fruit to the top of it. We do a lot of frozen waffles, yogurt, muffins, cheese sticks. Mine like eggs, but only scrambled…. and no one has time for that foolishness before daycare drop off. Daycare also feeds them “second breakfast” so ours is more of a substantial snack to tide them over. Microwave scrambled eggs! When I was pregnant and trying to feed my toddler an easy dinner, I’d scramble an egg in a coffee cup and stick it in the microwave. It was something like 30 seconds, stir, another 30 seconds. It worked surprisingly well and was much less of a mess. You could even scramble the egg the night before and stick the coffee cup in the fridge, and just give it a quick stir before you nuke it. My kid has been eating oatmeal (the sugary, instant kind, made with milk) for breakfast lately. Other favorites are bagels and cream cheese, Nature Valley protein bars, and peanut butter and jelly. We don’t buy cold cereal often, but he’s had Special K cereal a few times when my parents were visiting and bought it for themselves. DH usually handles weekday breakfast, but I do it probably once or twice a week and on weekends. We eat oatmeal probably 5 days a week, with peanut butter mixed in for protein and usually some kind of fruit for the kid. I like mine savory with an egg and some avocado. I used to eat toast and eggs for breakfast, which I still do from time to time as it’s faster, but I wanted to model better habits for my daughter. On Saturdays I usually sleep in and the odds are high that she gets yogurt in a pouch to eat while watching Sesame Street. Sundays I try to make pancakes or we all get bagels and lox or something else “special.” I’ve always been a big breakfast person so I hope we can continue this even after school becomes a more regular part of our lives. Cereal and milk, which is pretty much what I eat, too. I sometimes try to get them to eat something else, but they always beg for cereal, so it’s a double pain that way. To be fair, that’s what I ate for breakfast the vast majority of the time when I was a kid, too. Breakfast is our “together” meal as both my husband and I have more relaxed morning schedules and (especially him) frequent evening work. We do eggs a lot (I’m on WW so I like the low points), sometimes we might do pancakes – we freeze leftovers for something quicker, we do baked oatmeal or steel cut oats quite a bit. I am grateful for relaxed mornings and I’m trying to cherish it while it’s a reality since I’m sure it won’t always be that way. Plain fat greek yogurt with chopped fruit for all of us, almost every single morning. Once a week I’ll do “banancakes” (blend together a banana plus two eggs and cook it like a pancake), and once a week I make smoothies (spinach, kefir, frozen berries). But that’s about it. She gets so many carbs at school (the school’s snack program is heavy on the crackers/cookies/pretzels/etc) that I try to make breakfast mostly about fruit and protein. During the week, they typically eat cereal, granola/yogurt, or cottage cheese, something with a bit of fruit, and make it themselves. My youngest is 7, and he has been making his own breakfast since 1st grade. My oldest “doesn’t eat breakfast” and just drinks coffee now. I don’t love that, but not a fight I feel like having and I can’t say I don’t do that sometimes. We’ll do American breakfast, breakfast burritos/tacos, etc. on the weekend. Oh, and nothing sugary. Cheerios or Rice Krispies, plain greek yogurt. They can add some honey. My middle child likes seeds to a point it is weird, and likes to add all kinds of seeds to his yogurt/cottage cheese (sesame, pumpkin, flax, sunflower, etc.). Healthy, so it is fine by me. My husband and I leave together at 0715. He gets up early and makes scrambled eggs for himself, three kids and the Au Pair. He lays the table with toast, fruit (whatever is seasonal), the eggs, milk to drink, and makes me coffee. I get up 15 -30 minutes before I leave and grab a coffee. I make bulk Bircher Muesli on weekends and bring it with me to work. My kids are crows, so sometimes ask for some as I am packing it and the Au Pair deals with that. My husband packs their lunches while he cooks the eggs. (50% of the time, I have either prepacked their main for heating up or just prepped the whole lunch, but he fills in whatever needs to done.) The kids complain occasionally about eating the same thing every day but too bad. I will throw them a bone and make French toast or pancakes on the weekend once in awhile and my husband does bacon every weekend. I want to come to your breakfast buffet. Having breakfast made before I wake up is my favorite. “Calories and sugar are always on my mind as a mom” too, but my principal worry is whether my kid is getting *enough* calories at breakfast, not too many! Yep. We have big eaters and I have never once ever worried about calories. I do make an effort to make meals high fat, high fiber, and high protein. Our son usually has cereal or oatmeal, a granola bar and some veggie puree or fruit on the weekdays (he usually eats a bit of each) + milk. I have a Fage yogurt + a banana, husband usually has eggs or a bagel and cream cheese. On the weekends, my husband does a bigger breakfast – we usually have scrambled eggs/omelette + potatoes or waffles + potatoes. We generally eat breakfast together. Before we moved this summer, I used to get up with DD (just turned 2), feed her an egg/banana pancake, and then drop her at daycare around 730 where she would eat more of the same pancakes and a giant serving of fresh berries. I would then come home and have my coffee and breakfast (overnight oats if I had my act together, otherwise probably toast or cold cereal) in peace while getting ready and listening to the news…ah, bliss. Now, new daycare starts an hour later and due to traffic patterns it’s not feasible to come back home after dropoff, even though daycare is only 1.5 miles away. So I have to get ready with her in tow, and our mornings have regressed into both of us eating blueberry toaster waffles while we snuggle and watch Daniel Tiger or Stinky and Dirty, then migrate to the bathroom where she plays and I get ready. Not ideal, but I’m also 8 mos pregnant and I’ve decided this works well enough for now. DH leaves for work at 6am almost every day, so I’m solo parenting 99% of the time weekday mornings. We give the options of cereal and milk (Wheaties right now), plain instant oatmeal with peanut butter, or yogurt with cereal mixed in for my youngest or plain for my oldest (flavored, sweetened but I try to keep it reasonable). I eat cereal and milk or oatmeal with them while my husband gets ready. I have done fruit in the past, but have gotten away from it. My oldest has lunch at 10:30 so I am not that worried about holding him over until then. I did raisin bran before I realized how much added sugar it has. We all eat breakfast together in the morning. We eat bread (some slices with healthier toppings like cheese or hummus, some are more of a treat with jam or PB) and fresh fruit (I prefer berries and bananas as there is zero prep), plus the 1 year old gets a small bottle of milk. She eats very little, she gets a second breakfast of muesli and yogurt at daycare around 9am. We recently got a bread machine which we run at night, so all that’s left to do in the morning is to slice the warm loaf and brew coffee. It works well for us as we all have the option of a hot lunch at work and daycare respectively and don’t need to rely on sandwiches. We eat a small loaf between the 3 of us, and I keep the ends to make French toast on the weekend. It’s also what we’ve found to be the lowest on refined sugar while still holding everyone over until lunch. I did oatmeal overnight in the slow cooker for a while, but right now I’d rather not generate extra dishes to wash. Baked oatmeal! Super easy to make a bit batch on the weekend and then reheat throughout the week. There are a million recipes, but I like pumpkin baked oatmeal and apple cinnamon raisin. I use maple syrup as the sweetener, and it’s a nice way to make sure my toddler gets protein, healthy fats, and fruit all in one dish. Super easy to customize too based on likes and dislikes. My elementary schooler likes frozen waffles (eggo or costco healthier) with peanut butter, and luckily she can toast them herself now. I try to force a glass of OJ which she rarely finishes. She’s too distracted by hairclips and whatever else to finish, but they have a snack in her classroom around 9:30 so we try to choose a healthy option (ie fruit or a Kids Lara Bar). Top of mind for me is a balanced diet. She buys lunch almost every day and would eat carbs + dairy exclusively as almost every meal. I know she’s getting enough calories typically, but we’ve gotten into the habit of checking in on her fruit/veg count every night and if she hasn’t had at least 3 different fruits/veg she has a piece of fruit for dessert. My son commutes with me by train. He has a kodiak cake waffle (super tasy and 12 grams of protein), an apple and sometimes some dry cereal. We love them. Can’t say enough about smoothies for kid breakfasts, I have a 3.5 and a 1.5 year old and we do smoothies every morning of life. And I love not having to clean the high chair…! We use the Take N Toss straw cups, no mess. And I’m getting greens into my kids before 8am…the best! This morning was plain Greek yogurt, banana, powdered peanut butter, chia seeds, spinach, milk.